Welcome to the final post on this project! Okay, on to the last photos to share with you. 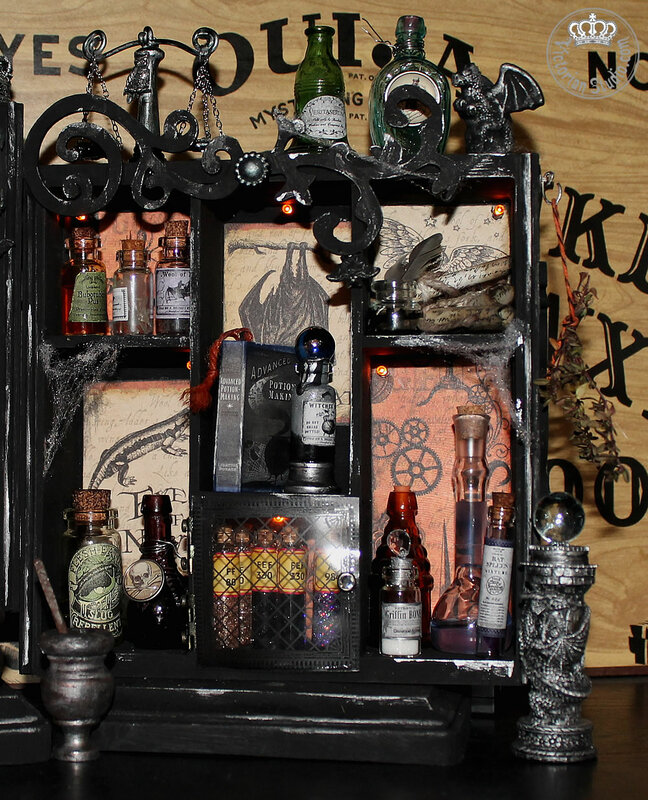 The center portion of the cabinet is topped with a large wooden scroll with a black bat propped in the middle. 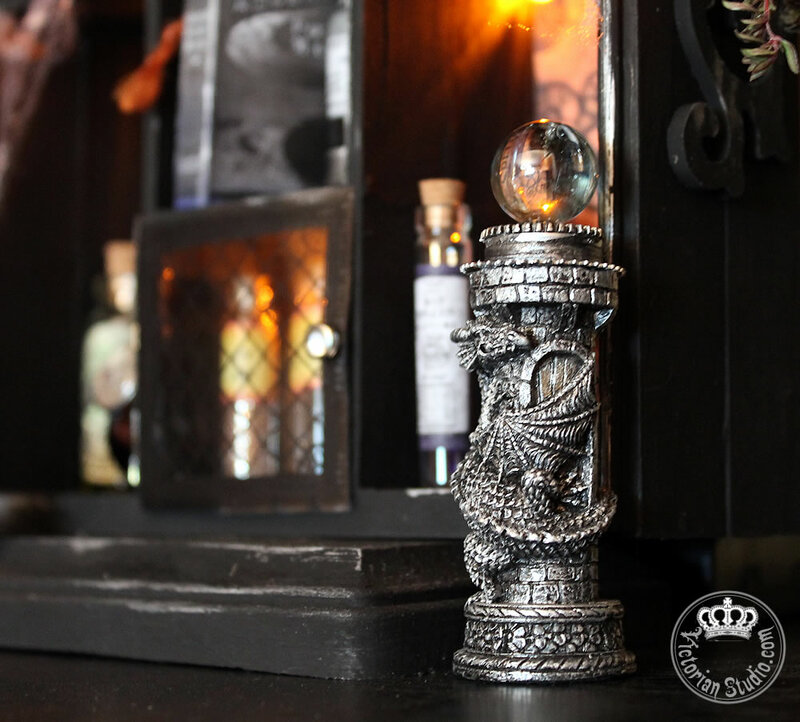 On each side I placed two very cool dragon chess pieces; found at the thrift store, they were the perfect addition to the decor. Below these I hung two "lanterns". Actually they are charms to which I added a piece of orange glue for a "light". At the bottom of each is a hanging bat (if they're hard to see, click to biggify the photo). 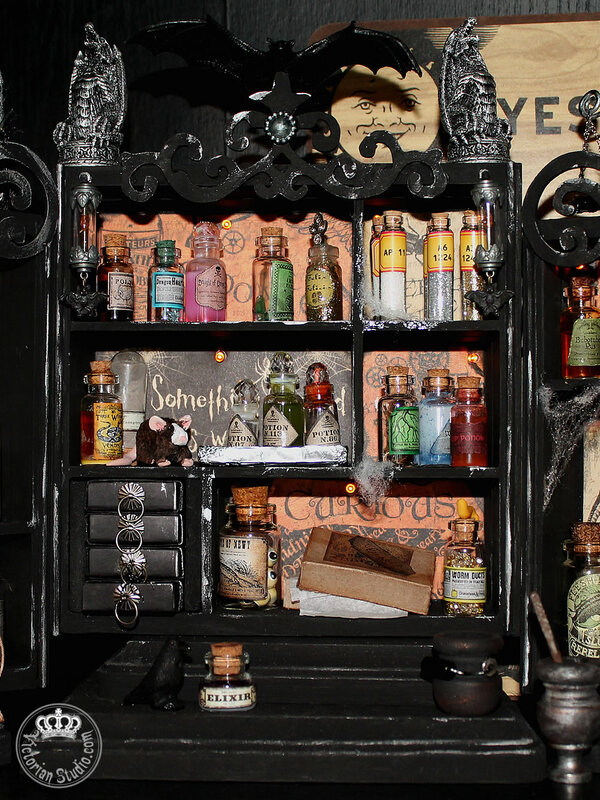 Oh, and amongst the potions is a furry lab pet - can you spot him? Sixteen potion bottles (not including the glitter ones pre-filled and labelled) were added to the shelves of this section. You'll notice I added a ruler to the first photo, just a reminder of how tiny these things are! Draught Of Living Death - Alcohol hand sanitizer once again this time with pink Copic refill ink. I topped this bottle with a clear pink bead. Dragon Heartstring - A few lengths of blue glitter wire. 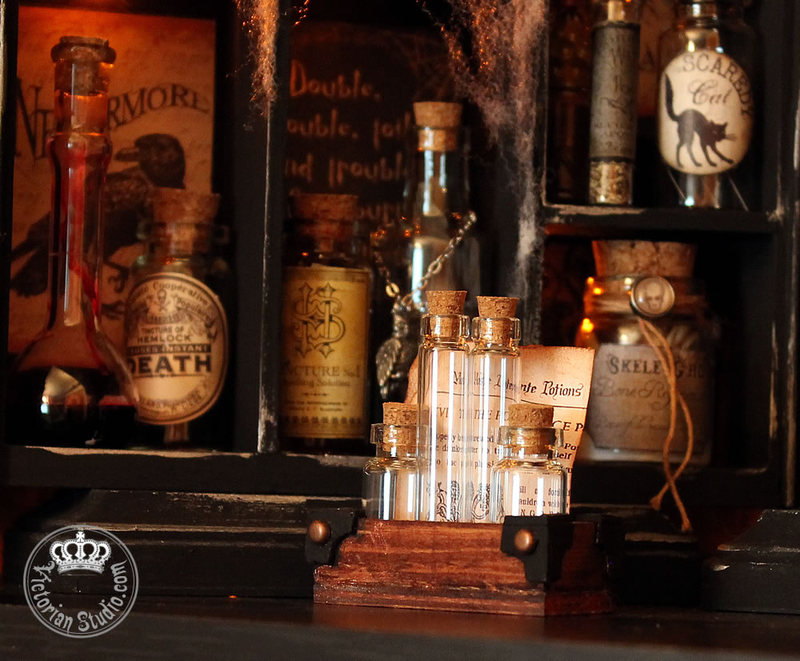 Polyjuice Potion - Straight out of Harry Potter; a vile drink to turn you (temporarily) into someone (or something) else. Brown ink diluted with hand sanitizer. Frog Part Mixture - Again, Glossy Accents poured onto my craft sheet in various shapes, left to dry then dyed with green alcohol ink. 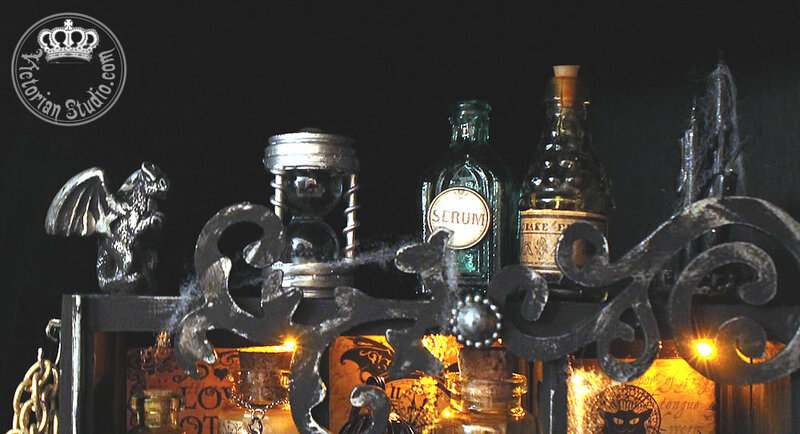 Three Witches Venom - Orange alcohol ink and alcohol sanitizer. Vampire Ashes - Good thing I didn't completely clean out our fireplace - yes, those are REAL ashes. Of the wood kind, thankfully. Elixir - a two toned liquid of alcohol ink and alcohol sanitizer - I just didn't mix it up, leaving it layered for a neat effect. 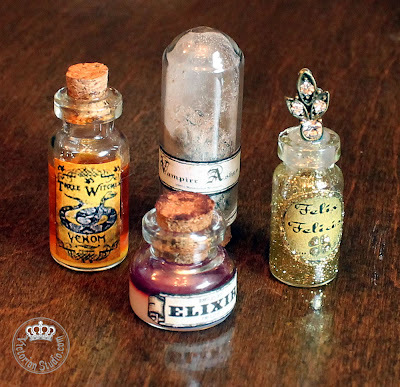 Felix Felicis - "Liquid Luck" from Harry Potter. Gold glitter added to the sanitizer, Stickles added to the label and a bit of bling from an old earring make this a very glitzy potion for sure. Worm Ducts - Imagine having a plastic envelope with micro beads of all colours. Then imagine you ONLY want the yellow and clear ones... yeah. I did that. Spent quite awhile picking out just those ones to add to this bottle. Then I sculpted a little worm for the top. Coloured him yellow with Copics, added two little black eyes, then glued him to the cork. 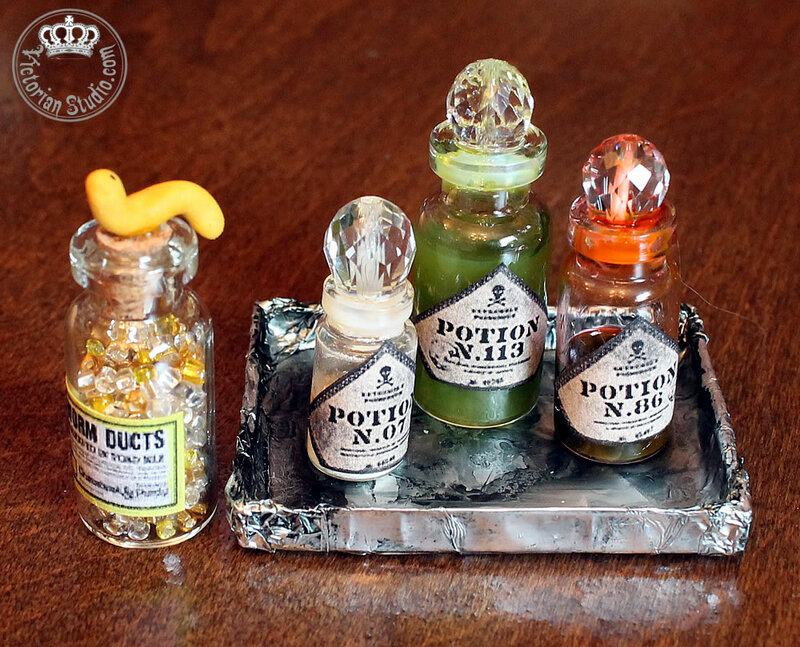 Three Potions - The silver tray holds three special bottles. They all have real Swarovski crystals for stoppers! I bought them in a bead store at the Mall of America (where I also picked up the crow, bat and dragon beads). Each bottle has a variation of the same alcohol ink/sanitizer solution in various colours. Eye Of Newt - What exactly does a newt's eye look like? Well, I Googled it and yep, they are yellow with a band of gray. So I rolled out some Sculpey, baked them and coloured each one in with Copics. Then I covered each with Glossy Accents to make them shiny. Hemlock Root - Real roots from small plants in my yard. Maybe not hemlock... er, thank goodness. Wolfsbane Potion - This milky blue solution was vital to Professor Lupin in Harry Potter - a werewolf who kept his transformations at bay with this elixir. 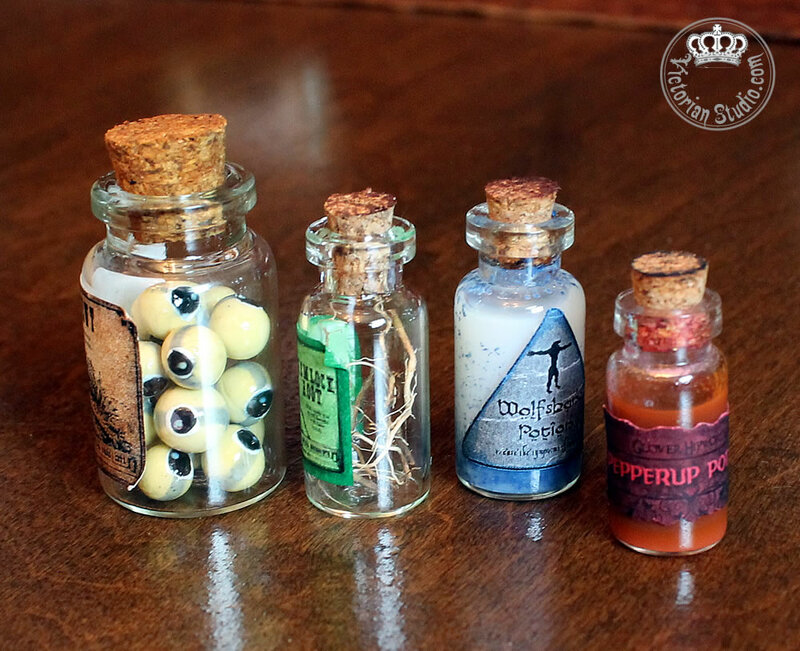 Pepperup Potion - Another Harry Potter potion used for simple recovery from colds. Red alcohol ink, Glossy Accents and hand sanitizer is the recipe for this one. 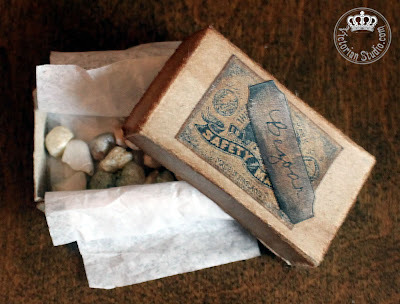 Bezoars - Harry saved Ron's life with one of these; a poison antidote that looks like small rocks. I made the 1" by 2" box from an old toothpaste carton, after tearing off the printed layer. Tissue paper lines the inside. I inked and distressed the box and added two inked labels. 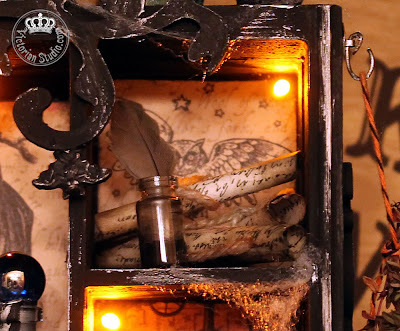 I also mentioned at the beginning of this series that the four drawers were lined with Halloween paper and did indeed have items in them. I thought I would also show you... here are the extra potion labels and a small folder with the tiny spider I made from wire and black alcohol ink. So I guess that's it! If you have any questions, please ask! I hope you enjoyed this extremely lengthy series. 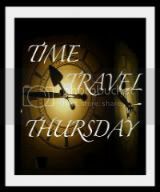 My thanks to Laura at Artfully Musing for her inspiration and wonderful tutorials; without which I never would have attempted such a project. Well, today's post won't be too long, as there is less to talk about on the right side of the apothecary cabinet. 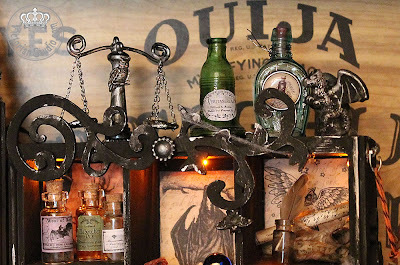 I have already explained how I made the teenie set of scales... the only other items on the top of this part include two more antique bottles and another small dragon bead that was repainted - it used to be a gaudy green and yellow. The hook on this side holds a sprig of thyme. I wanted some drying herbs, so I pinched a small bit from my plant on the deck and wound a piece of baker's twine around it (after colouring orange with Copics) and hung it from the Tim Holtz fastener re-formed into a hook. Wool Of Bat - Yep, that's real wool alright - however, it's sheep, not BAT wool... from dear Sarah at Punkin's Patch. 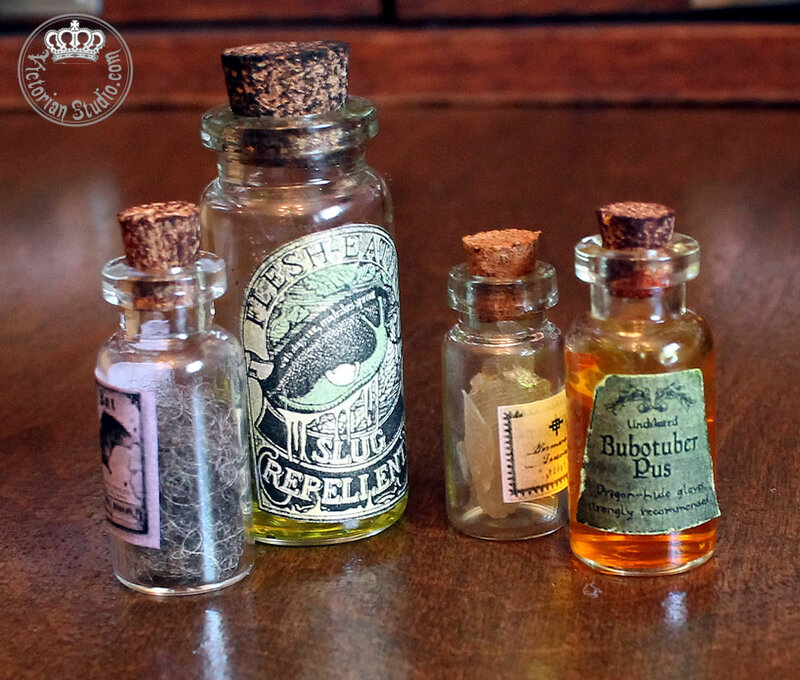 Flesh Eating Slug Repellant - Another Harry Potter reference... Hagrid always had a good supply on hand. This was the first potion I mixed up; alcohol hand sanitizer with green alcohol ink. Snakeskin - Okay, it's actually glue imprints of MY skin. As I was adhering labels and getting really messy, I thought it would be cool to peel off my fingerprints in the dried glue for some neat effects. Bubotuber Pus (Undiluted) - Simply alcohol sanitizer and orange alcohol ink. Bat Spleen - This time I poured small drops of glue on my Ranger craft mat and let them dry overnight. Then I inked them with their Eggplant dye, rolled them up and popped them into this tall tube. Griffin Bone - Being a Gryffindor at Pottermore, I wanted to make this ingredient extra special. So I added a crystal to the silver-painted cork and filled the bottle with Martha Stewart Extra Fine White Glitter. Love the shimmer! 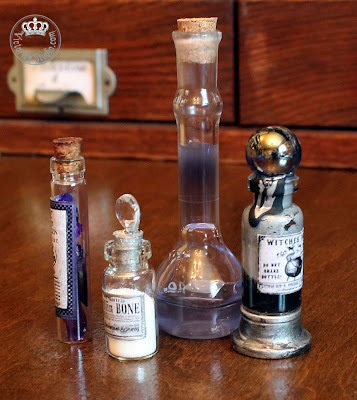 Purple Potion - a mysterious concoction in a real laboratory 10ml flask. A mixture of alcohol sanitizer and purple Copic refill ink. Witches Brew - I added a silver base to this bottle and adhered a metallic marble for the stopper. Black and silver acrylic paint was layered on the inside and also painted for a striped effect on the drip making its way down the outside of the bottle. One more post to go to complete this project... up next, the center section. 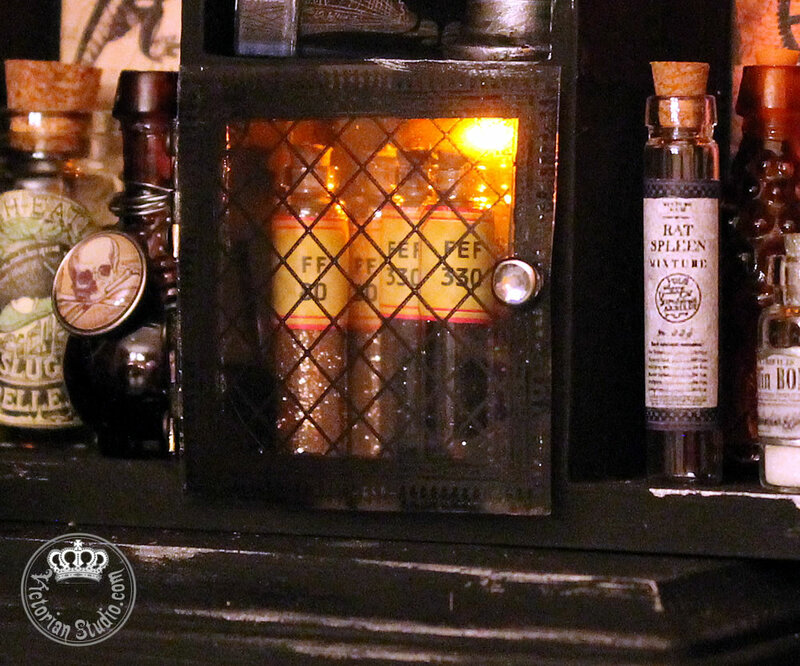 Today I'll be showing a close up of the left side of my Apothecary cabinet with details of the potion bottles stored in this section. The top is decorated with a small dragon bead I got while in the US over the summer. I painted it black and silver and attached it with E6000 glue. Next to it is my teenie home-made hourglass, two antique bottles and a set of three black candles (simply birthday candles cut down and glued to a painted bottlecap for a base). On the side I glued another Tim Holtz fastener (the same kind I used for the drawers) and opened the ring to create a hook, from which I hung a string of chain. 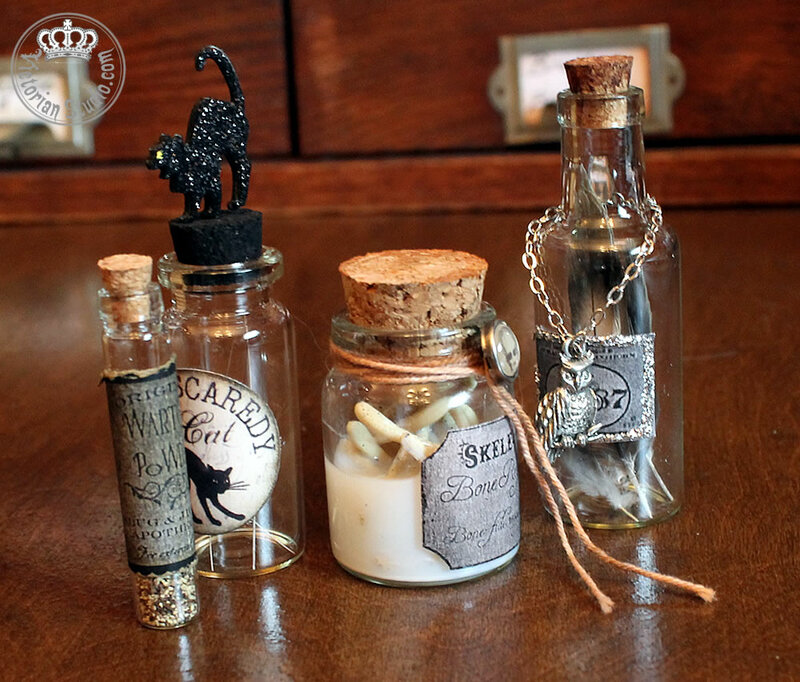 The only other non-bottle item in this section is a very small birdcage; a charm I added a new handle to, then used black alcohol ink to age and distress. Okay, on to the potions. I've removed the bottles from the cabinet for a clearer view. 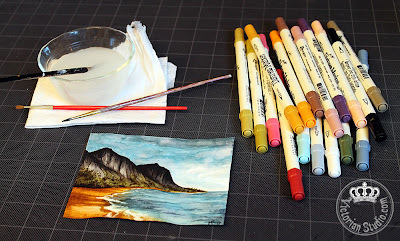 Most liquid contents are a combination of liquid alcohol hand sanitizer, alcohol inks for colour (Ranger or Copic refillers), paint or Glossy Accents glue. 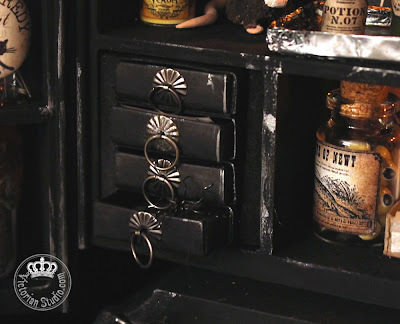 Of the 15 potion bottles in this section (not including the four empty ones in the crate), 12 are filled with different items to reflect the label attached. Remember to click to biggify all these images. Toe Of Frog - I used Scupley to create the "toes" and added hand sanitizer coloured green with alcohol ink. Sliced Caterpillar - Again, Sculpey was rolled into a log shape and cut, cooked and coloured with Copics. Coffin Nails - Toothpicks cut to size, painted black and silver. Amortentia - a love potion from Harry Potter. Hand sanitizer and Glossy Accents mixed together. I added part of a heart earring for a charm. Essence of Dittany - a small leaved plant, covered in Glossy Accents to preserve it. Blood - that's a real lab flask, but the blood's not real... ;) It's pure alcohol ink. Tincture of Hemlock - pure black alcohol ink and some cotton for "vapors". Wartcap Powder - simply ground pepper. Scaredy Cat Whiskers - donated by each of my three felines - yep, those are real! I loved Laura Carson's idea for the cork decor - two black cat stickers sandwich a pin inserted into the cork. Skele-Gro - from Harry Potter, an important potion to regrow bones. 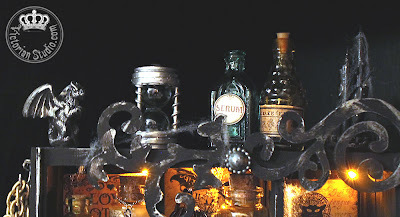 I used a Tim Holtz bottle of wishbones and added a solution of alcohol sanitizer and Glossy Accents for the milky white liquid. I also attached a skull charm to the string wrap. Owl Feathers - well, okay. I don't actually OWN an owl (I wish! ), so Meeka the lovebird supplied the feathers. I added an owl charm to this one as well as some silver Stickles to the label. I found all these labels on the net and resized them as small as I could to fit these tiny bottles. I used Glossy Accents to adhere them after colouring with Copic markers or Distress Inks and markers. Now on with more accessories before I get to the actual potion bottles. After researching photos from Harry Potter and other "mad scientist" laboratories, I made a list of things I wanted to include in my apothecary. 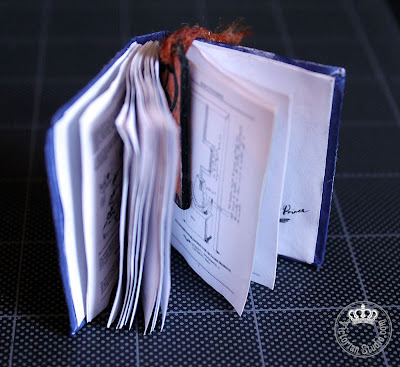 Since the project was so small, I was resigned to the fact that many of these items I would simply have to create myself. First, a set of scales. I tried many different methods to try to figure this one out... wood, chipboard... ugh, it was very frustrating trying to find something that would work. I ended up using a wooden dowel for the center post atop various washers and nuts for a base. I used large gauge soft aluminum wire for the arms, jewelry chain and aluminum foil for the pans and an owl charm to decorate the front. Silver paint pulled them all together and the arms actually move! Next up; a crystal ball. I had the good luck to find a bag of Wizard and Dragon-themed chess pieces at Goodwill. The base of my crystal ball stand is a Rook. (I also used two of the awesome dragons on the top of the center unit). I found some old watch gears and metal washers, stacked them on top of the Rook and added a clear marble to the top with E6000 glue. (Oh yeah, it was another trip to the Dollar Store for a bag of clear marbles...). Speaking of marbles, after many failed attempts with other not-so-great ideas, I came up with the thought that two clear marbles may just suffice for an itsy-bitsy hourglass. I glued them together, then added more metal washers and a button to both ends. Three toothpicks wrapped with wire were added and the whole thing was painted silver. I also added an owl brad to the top. Cauldron and mortar/pestle - I made these two items from the same thing; wooden dowel caps I found at Michael's. For the cauldron (the one at the back), I painted it black after hollowing it out a bit. I rubbed copper paste on the outside and added some jewelry bits and wire for the handle. For the mortar, I glued it onto a piece of metal for a stand (I have no idea where it's from...), rubbed silver paint on it and added an old rusty tool for the pestle that was in a box of random vintage game pieces I got from a seller on Etsy. 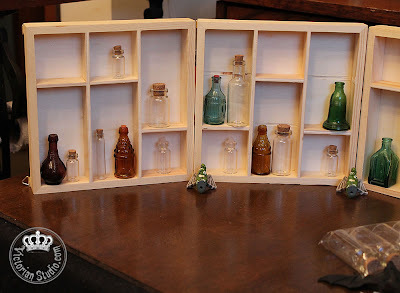 I came across images that showed boxes of bottles and newspapers on the floor of some labs; so I used a few pieces of the wood I removed from the cabinets, cut them down and made a box using chipboard for the black corner pieces and copper brads for nail heads. I also printed off the page about Polyjuice Potion and tucked it in. A few empty bottles fit perfectly and viola! A crate of supplies ready for future potion making. 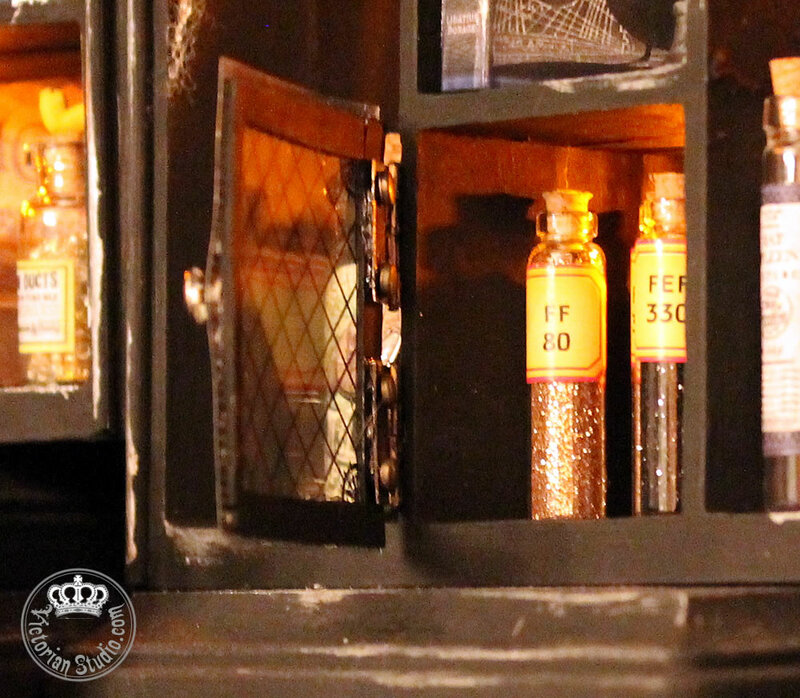 So that's it for the accessories... next up, a closer look at each section and the bottles in them beginning in Part Four. 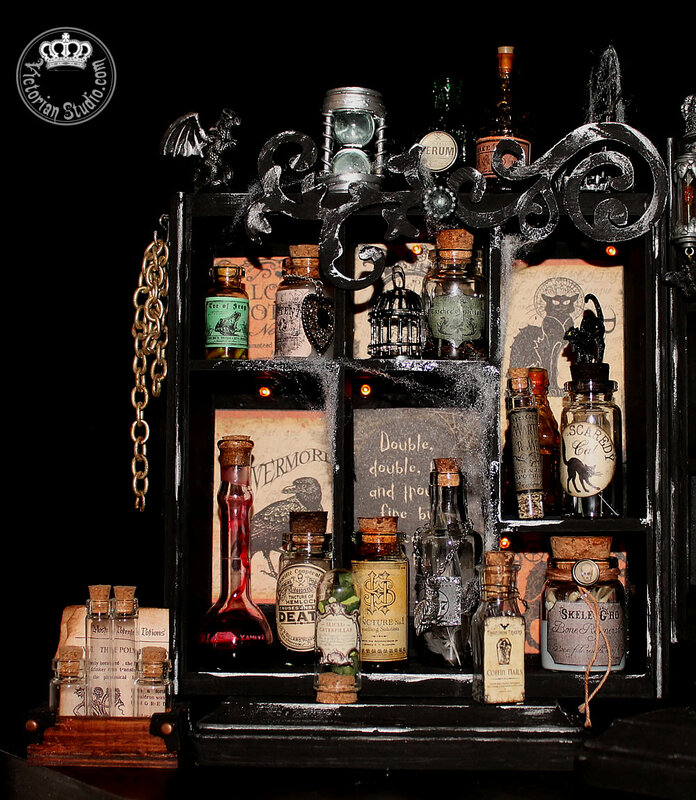 If you haven't read it already, you can find Part One of my Halloween Apothecary project in this post. Today I'll go into more depth of how I made a few special features and accessories. 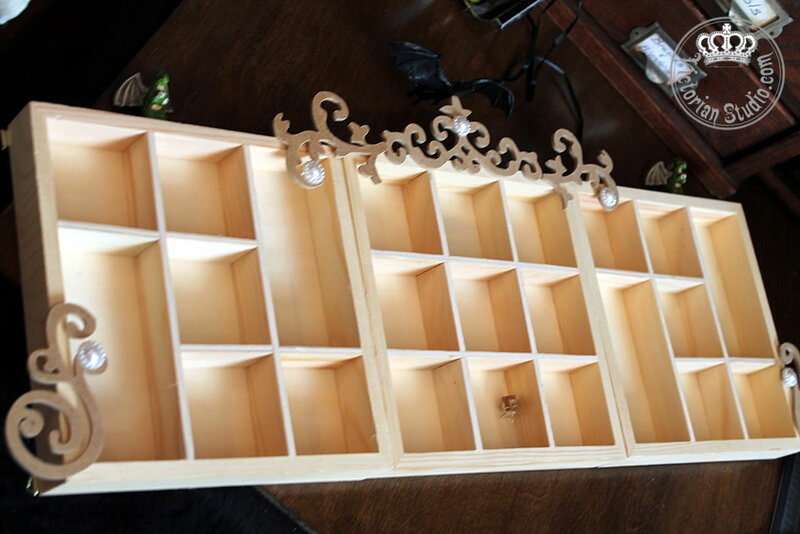 I didn't want every section to be all shelves; so in the center unit, I inserted four matchbook boxes to create a set of drawers. I had to pad the sides with a bit of foam core board to make it a snug fit. I painted each drawer black, glued them together and lined them with Halloween patterned paper. 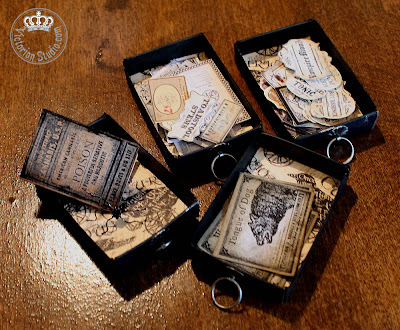 I used Tim Holtz' ring fasteners to serve as handles. 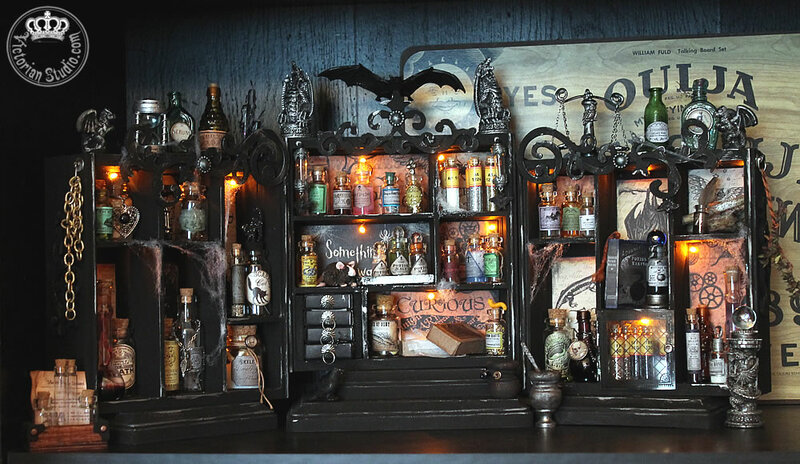 Each drawer is filled with spare potion labels... and if you look closely (click to biggify), something is crawling it's way out of the bottom one. After viewing many Harry Potter reference photos, I wanted to add leaded glass somewhere to my project. Hogwart's is full of the diamond-patterned windows so I decided to create a door for one section decorated in that style. I tried many different methods; chipboard frames, plastic slide cases, I searched through my Cricut patterns.... nothing seemed to work well. Then I decided to just try a transparency sheet. I drew the pattern, re-sized, printed and cut it to cover a single square opening. 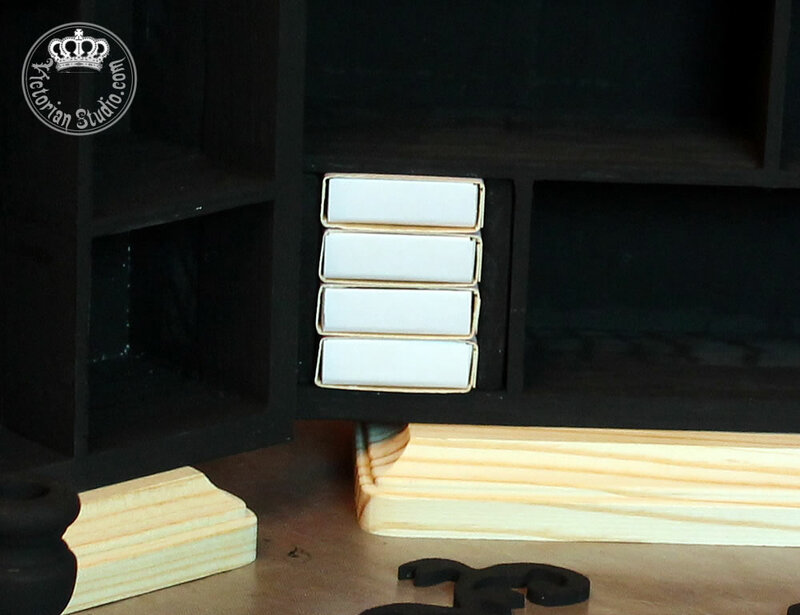 After reinforcing the edges with black painted chipboard on the back, I added a gem brad for a door handle and two small hinges and attached the other side of the hinges to the wood frame. Inside this section (and one other section in the middle unit) I have quite a few "test tube" style bottles that were on sale in the jewelery section at Michaels. All I did was remove the wire hook on the tops; they already were filled with glitter and sported those neat labels. 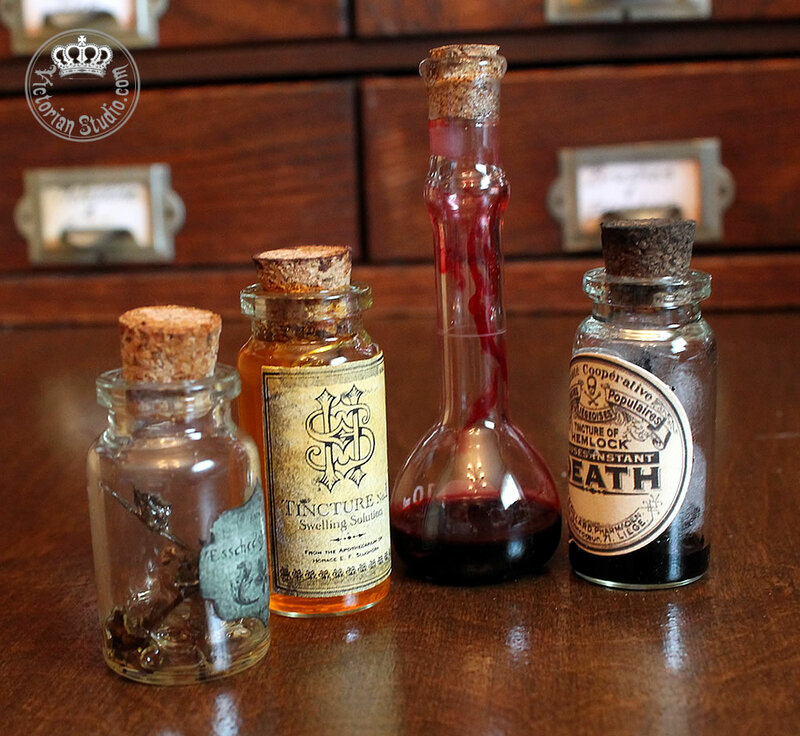 Every well-appointed apothecary requires some reference material. 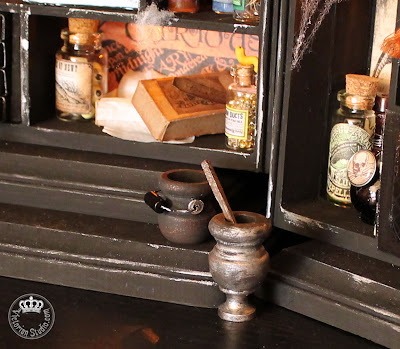 So, on the upper right one cubby one will find three aged scrolls and a quill pen in an inkwell. The quill is a real feather; the scrolls were made with plain paper stamped, inked and rolled with dyed string. Then I made a book all Potter fans will recognize; this teenie "Advanced Potion Making" textbook was created using pages and book cover images I found on the net, shrinking them down dramatically to fit on the shelf. After colouring with blue Copics, I wrapped the cover image around some thin cardboard (actually an old toothpaste box with the layer of graphics torn off!). 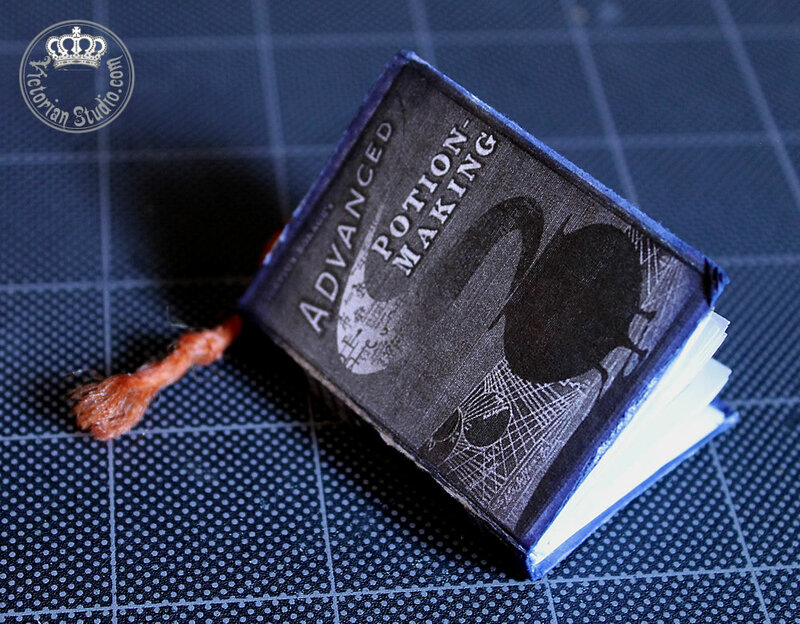 I inked and sanded the edges and bent the corners to portray the appropriate amount of wear (Ron and Harry fought over who WOULDN'T be stuck with this old book, it was so worn out). I then glued the each of the uniquely-printed pages together and made sure that last page had "This book is the property of the Half Blood Prince" just like the movie prop (albeit in a much smaller scale!). I also made a bookmark with Halloween paper, chipboard and string tassel. At about 2 inches tall, this is by far the smallest text I've ever made! Well, I guess that is enough for today. I'll continue more about the project in Part Three. Okay.... here it is.... a project I've been working on for weeks now! Because there is a LOT to show you, I will break it up into numerous posts. It all started quite simply - it didn't end that way though. 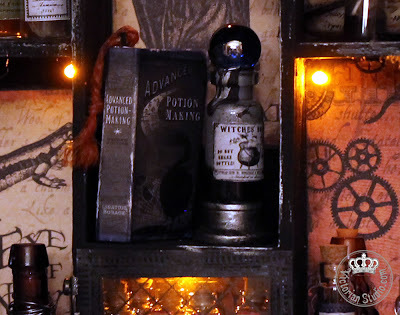 After completing my Mini Apothecary book, I knew I wanted to make a larger version for permanent display in my Studio - because after Christmas, Halloween is my favorite holiday. 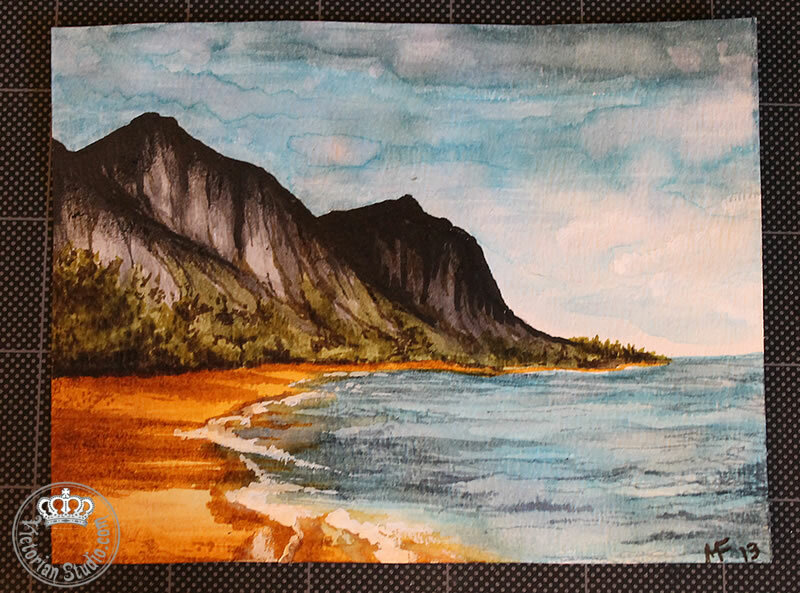 I watched Laura Carson's video tutorials at Artfully Musing numerous times and was inspired to do my own take, but not a direct copy of, her wonderful creations. 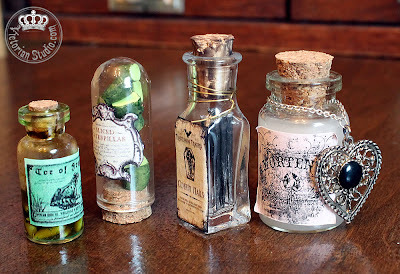 I decided to use mini bottles again to keep it from getting too large, so I got out all the antique teenie tiny bottles I had and used 40% off Michael's coupons to buy a few packages of Tim Holtz' bottle sets. I also found two sizes of mini glass bottles with corks at the Dollar Store, so I brought home a few packages of six each. I also discovered some wooden shelves there that I thought would be the perfect size to display my potions; they were divided into nine square sections so I bought three to make a display that would fit in a corner, thinking I would hinge them together. 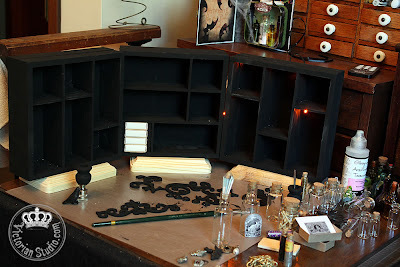 I removed some of the dividers to create sections for larger bottles to stand. When I got them home though, I realized the shelves were not deep enough, so back I went and bought another three. I pulled the back off one set and glued them two deep to create my base unit. I then added four wooden stands; two for the center section and one under each side panel to add varying heights for interest. I also applied wooden scrolls from the Dollar Store to the tops and sides, as well as brads and wooden skewers for more detail. Then everything was painted flat black. I picked up some mini Halloween lights at Michael's and punched holes into each section so they would poke through. Then I cut background papers from Graphic 45's Steampunk Spells paper, glued them to the back of each section, and inserted the lights from behind. I made two sections different from all the others; in one I placed four matchboxes for a set of drawers with pulls, and in another, I would add a "leaded glass" door to the front (er, to be truthful, it's simply a transparency with a brad for a handle attached with two brass hinges). 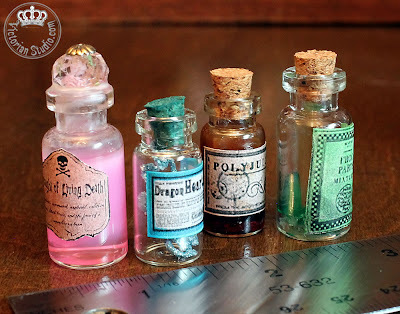 I'll explain how I did each section with close-ups of most of the potions with their contents (oh yes, each one is different!) and a few hand-made accessories I created from whatever I could find in my stash (and on hubby's workbench - shhhhh!) and even a couple that are hand-sculpted. 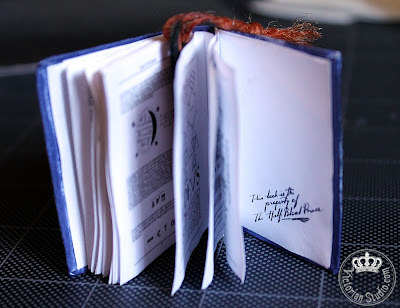 Oh and for those Harry Potter fans like me, you will find more than a few references in here too! Unfortunately, a co-worker lost her brother recently, so I was asked to make a card to add to a gift we are sending her. 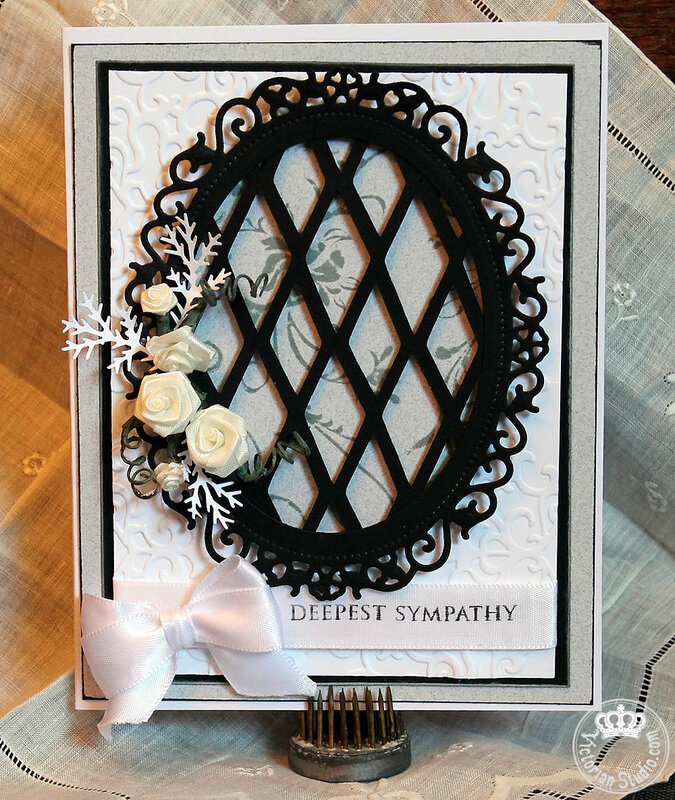 I have been watching Christina Griffith's YouTube videos and she has done such beautiful work with layered cards using a new Spellbinder's die for a lattice effect. Since I don't have this die, I searched my Cricut cartridge books and found an Arglye pattern I re-sized to fit inside an oval Spellbinder frame. I popped up that black frame on some foam dimensionals over top gray paper stamped with Ranger's Iced Spruce Distress ink and Inkadinkadoo floral stamps. That layer was placed on embossed white cardstock which was matted with black and gray sheets and inked on the edges. 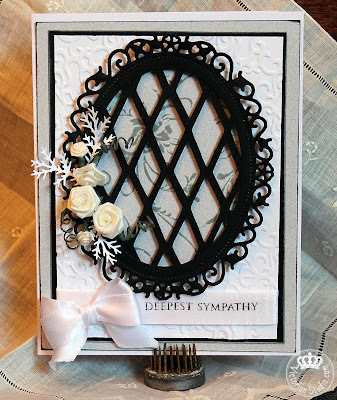 The ribbon was stamped with the sentiment using Stazon ink and a white double-bow added with Glossy Accents. The flowers and Martha Stewart fern punched leaves were also adhered with Glossy Accents. A better view showing the lattice raised up above the stamped background. 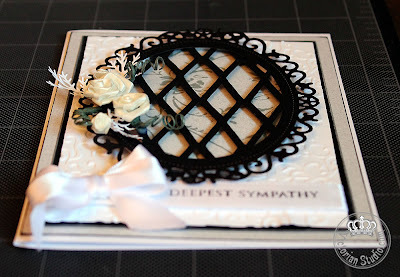 Christina has such nice videos; I really love trying new ideas and like the effect this one gives to a card. When daughter and I were in the US over the summer, I made sure to stop by Hobby Lobby with a few 40% coupons so I could stock up on Tim Holtz' Distress Markers. I love his Distress Inks and Stains, so I thought I'd like to try his markers as well, especially after seeing him demo them on YouTube. They are completely different from the alcohol Copic markers - these are water-based. I waited to purchase them in the States as a pack of five is a ridiculous $27.99 here in Canada! The same set at Hobby Lobby is $14.99 regular price, but with my 40% coupon, came to under $10 a pack. So far I have 17 of his 37 colours; three sets of five and the two-pack of Black Soot and Picket Fence (white). Today I finally found some time to try them out. 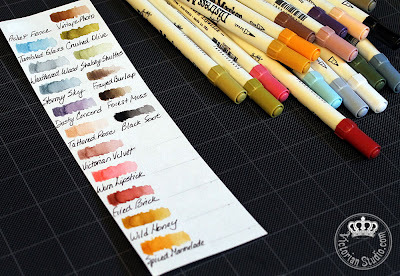 First, however, I took the advice of another YouTuber and created my own colour swatch on watercolour paper. It's a great reference since the pens' cap colours are not reflective of their true hues. After making that, I decided to try my hand at a quick sample to practice blending. Instead of a water brush, I used my regular paintbrushes and a bowl of water (after shooing away two cats attempting to drink from it...) and created a small landscape on a scrap of 90lb Beinfang Watercolour paper I have had for years but rarely used - I never really got the hang of watercolour painting, preferring oils instead. I LOVE the way it blends on this paper. After painting, I went back and used the same markers to create more details. The only one I could not get the greatest result from was the Picket Fence (white) marker. It is made to write on dark paper, so I am not surprised I didn't get the opaqueness I needed - I should have been more patient and waited for the piece to dry completely first. Instead I pulled out some white acrylic to do the sea foam. Otherwise, everything else on this piece is Distress Marker. Yep, I can see myself getting more of these; they are wonderful to work with, and I am sure they'll be a breeze to colour in stamps with too (just have to make sure I use StazOn ink or emboss the ink before attempting to add water to blend colours). I'll have to try that next.